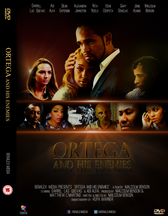 Take 101 goes behind the scene in the making of Ortega and His Enemies. Return of The Don as directed by the Cannes Certified Multi Award winning Director Malcolm A Benson hits Cinemas from Friday 31st March 2017. Return of The Don is showing at various cinemas including Silverbird Cinemas, Ozone Cinemas, Kada Cinemas, Viva Cinemas, Lighthouse Cinemas etc.